Woo-hoo! It’s the first recipe of the new year! You may also notice that this Crockpot Mashed Potatoes recipe is formatted differently than in the past. I have changed the recipe plugin that I use here on The Mom Maven. I will be updating all of my old recipes to this format as well. I hope it makes your user experience even more seamless. 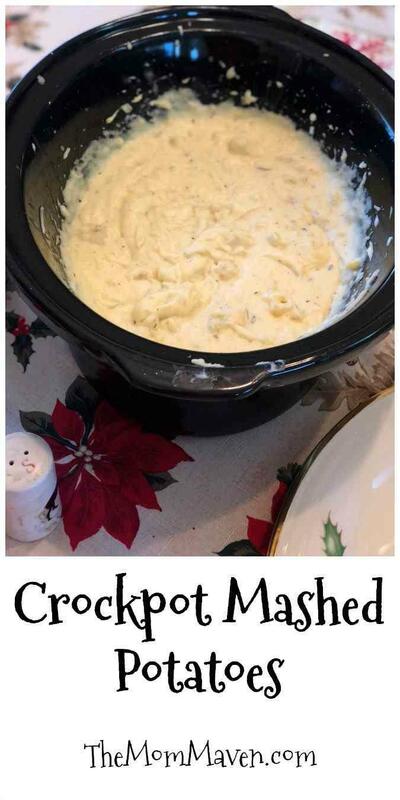 I made this crockpot mashed potatoes recipe for Christmas dinner at my in-law’s house. This Christmas was very different for us. For the last 15 years or so Christmas Eve has been spent at my in-law’s and Christmas Day is with my side of the family, at my parent’s house. Well, we were blessed with 2 “extra” Christmases in the family house after my dad passed away in November of 2015 but last year we lost the house. So all special occasions have been relocated to my sister’s house which is larger and better suited for entertaining than mine is. My niece works at a hospital and had to work December 24 and 25 so we did Christmas on the 23rd. Since we needed to have Christmas on Christmas Day, my in-law’s were excited to move our celebration with them to the big day. My mother-in-law made a delicious ham and I made these crockpot mashed potatoes, my slow cooker herbed cream corn, and my better than Christmas cake. We had a wonderful day of opening presents, eating delicious food, and playing games as a family. I found this recipe on Show Me the Yummy and it is so easy to make and very tasty. The potatoes reheat well too. I’m actually making these potatoes again today to bring to a family meal to bless a family after a funeral at our church. 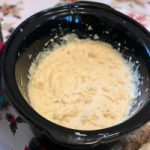 I am in love with this very easy Crockpot Mashed Potatoes recipe. It is perfect for any night of the week, holidays, or to bring to a potluck. Spray 6 qt crockpot with nonstick cooking spray. Place potatoes, broth, garlic, spices, and butter into the crockpot and stir to combine. Cover and cook on LOW for 7-8 hours or HIGH for 3-4 hours, until the potatoes are tender. Once the potatoes are cooked, stir in the cream cheese, Parmesan cheese, and sour cream. Use a hand mixer to blend potatoes until desired texture has been reached. Serve and enjoy!